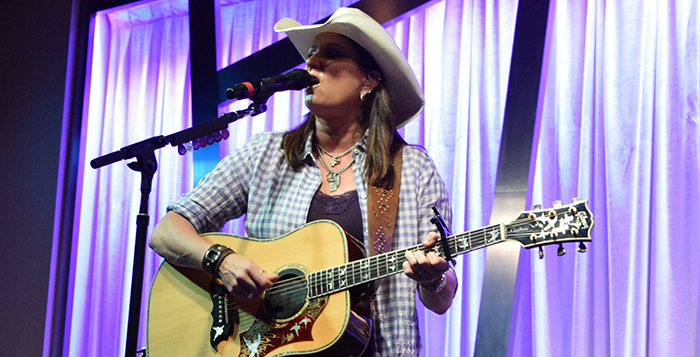 Multi-platinum-winning country artist Terri Clark commanded the stage Saturday night in front of a lively crowd inside Harrah’s Ak-Chin Casino lounge. Although Clark has had a successful career spanning nearly 20 years, she said she prefers playing smaller shows. “I like to play places where not everybody gets a big show or a national act because they are the most responsive crowds and they appreciate you being there,” Clark said. Along with a Canadian and European tour, Clark said working with a producer sometime this year to record an EP album could be in her future as well. The only obstacle in the process, according to Clark, is finding or writing the songs that stay true to who she is. “If I were recording stuff that I didn’t believe in, I don’t think the audience would believe it either,” Clark said. For more information and to hear more music by country music star Terri Clark, visit: www.terriclark.com.